We haven’t featured a full wedding film on the blog in some time and as we prepare for a beautiful 2015 wedding season I wanted to share a few feature films from 2014 with you! So here is the first one! This was such a lovely wedding day at a couple of my favorite venues – Our Lady of Sorrows and the Nelson-Atkins Museum. But more than the beautiful locations, the thing I love about this wedding is the way these two look at each other. Just watch them just light up when they are in each others eyes. Not to mention all the beautiful words that they said to each other and the words of their family telling their story. These are the reasons I love what I do and love to get to put together these beautiful little glimpses of a new family. Stay tuned for a few more special feature films in the next couple weeks as we get excited about our 2015 wedding season – as well as a few fun things we did over the winter! We do have a few weekends left on the 2015 wedding calendar – they won’t last long! If you are looking for a beautiful wedding video to be created in Kansas City, Midwest or destination wedding please shoot us an email! We look forward to so many beautiful wedding moments this year! I don’t really know how I keep getting so lucky to have such amazing couples. These two were so in LOVE and couldn’t stop smiling at each other and loving each other all day long it was just a JOY to be around them! Not to mention we got to shoot in our most favorite art gallery, the Nelson-Atkins Museum of Art yet again! Beautiful ceremony at Our Lady of Sorrows, and the Karen Davis Project just ROCKED the party at the Nelson! Such a beautiful day – enjoy your sneak peek guys!! Mallory and Casey’s wedding highlight is featured on Grey Likes Weddings Blog! So proud to have a feature today on Grey Likes Weddings! I discovered this blog a bit ago and have been following them for some time. So many pretty things there! So excited to have work now featured there today – and for it to be THIS wedding! Even more special! I filmed Mallory’s sisters wedding several years ago and just think the most of this family – such a special day with so many intimate details. Click on the image above to check out this pretty little wedding film! This was the perfect day. Mallory and Casey had so many personal touches that they brought to their wedding day and so many special family and friends there to celebrate with them. It was just perfect. I absolutely LOVED the spring flowers that fit so perfectly at the Hobbs Building and just a simple beauty that matched Mallory and Casey so well. From the intimate words spoken by the Pastor from Sabetha, KS, to the super fun Motown band The Goodfoot – it was just an amazing day. 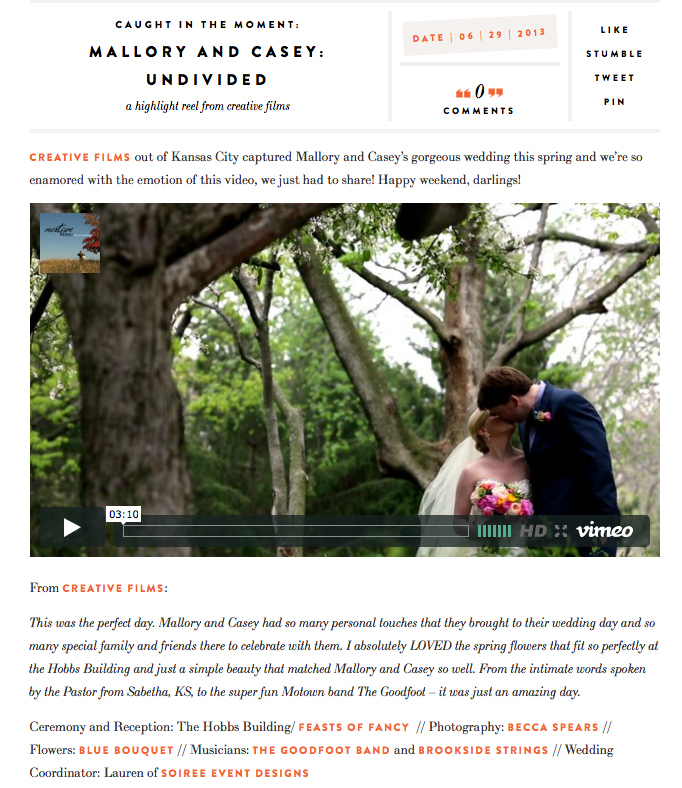 Mallory & Casey – Kansas City Wedding Highlight from creative films on Vimeo.